Christmas, isn’t Christmas till it happens in your heart…..
And this year, I may be home for Christmas, but the house is “empty”. The spark, the livewire that has always been my father isn’t around anymore. I hope it is way merrier up there pa. I miss you. Happy Christmas dear readers. It’s a time for family. Not presents, not clothes, not friends. It should be about family. Always. Have you ever had one of those days where you feel really blessed? I had one of those days yesterday. I had a marvellous cappuccino with some new friends, and as we sat in the sun, with the chilly air on our faces, sipping the most amazing cappuccino that somehow, only Italy manages to produce, I thanked God. How many times have we complained and wished for the unending material goods that always appeal to that greedy side of ours? If I have an apartment, I wished I had a big house with a garden instead. I may wear a pair of jeans in size S, but when I see tall, gorgeous women sashaying in their stilettos, I wished I were size XS and perhaps 15cm taller. I have a head full of thick black hair, but when I see women with cascading, silky hair, I wished I had less of a bush on my head and more of a styled, fresh-from-the-salon mane. I may not be working, and when I see women in their smart power suits, looking all corporate, I wished I had a (glamorous) job. And then I turn on the news and see children starving. I watch Slumdog Millionaire and I thank God I have a roof over my head, nevermind a house with a garden. I see medical programs where people need organ transplants, where little people afflicted with dwarfism have a 25% chance of having an unviable pregnancy, and I feel ashamed for wanting to be a size XS, for wanting to be taller. I go on to Facebook to see many of my friends lamenting over work stress, bosses from hell, and I feel guilty for not appreciating what I have; a husband who provides and enables us to live on one income. Living here for the past 2 years has made me appreciate everything on a greater scale. Funnily enough, it was in Malaysia when I had the spending power to purchase shoes, clothes, makeup. It was in Malaysia that I lived more extravagantly, dining out all the time, going to the movies, painting the town red with close friends. Say hello to my new best friend Lola. She’s the reason I’ve been absent from the blogosphere for quite a bit now. Isn’t she absolutely beautiful? Lola is a 90th Anniversary Limited Edition KitchenAid Stand Mixer. 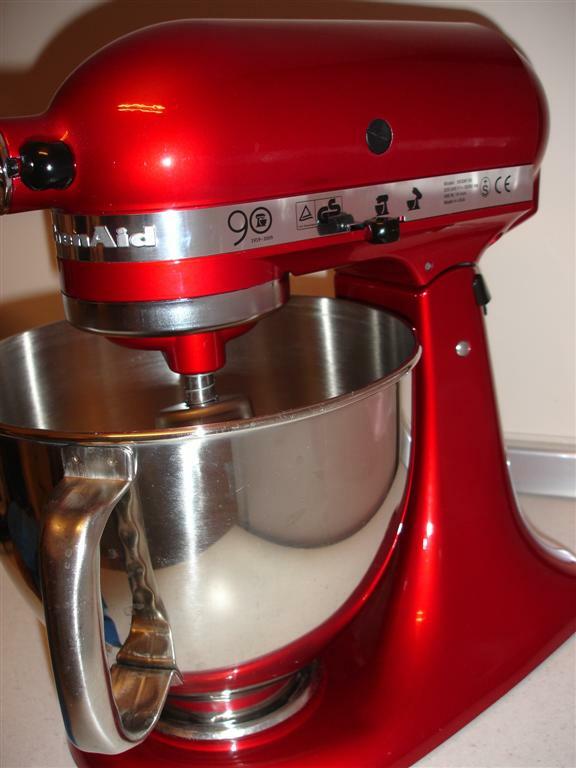 The first time I saw this particular Candy Apple Red KitchenAid was in John Lewis, Cardiff. I fell in love with it instantly. I had always wanted an Imperial Red mixer, but this one in Candy Apple Red just took my breath away. It has this sheen to it that makes it different from the Imperial Red. I found a good deal online, and after literally years of contemplating, I bought it. Or rather, the hubs bought it for me 😀 I have since effortlessly made some cakes with it, and oooohhh my, the KitchenAid really makes it effortless, as it works like a dream. I made a looooovely marble bundt cake with it, and although the hubs was away travelling, and I was alone at home, I baked, and since the recipe yields a lot (one bundt tin and one loaf tin), I had to eat it all by myself! And I didn’t get tired of it! Of course I kept it in the fridge and ate a slice 2-3 slices a day. In case you’re wondering, yes, I’ve been working out for at least 40 minutes 3-4 times a week to burn off all that extra calories I’ve been ingesting. I haven’t broken the scales yet. I went for a looooong overdue haircut today. My last haircut was on 20th May 2009 when I was in Malaysia I have put off going to the hairdresser’s for as long as I could due to the language factor as well as the fact that one needs to make an appointment first before going to the hairdresser’s. So a couple of months back, while I was still juggling with my driving lessons at the driving school, I saw this new salon open just next door to the driving school. This salon is not your usual salon. It was a Chinese (from China) salon. I didn’t think much of it until about a few weeks back when we received some promotional flyers from this salon. They charge about 12EUR for a cut and blow, about half the price of a normal Italian salon. It was filthy, there was hair all over, the hair brushes were clogged with hair, the counter was messy with all kinds of products strewn all over. I was already in there, and just SHOULD have run away, but I didn’t. There were 3 guys in there, one was glued to his laptop, and another 2 just didn’t seem all too bothered. He asked if I wanted to layer my hair, to which I agreed. 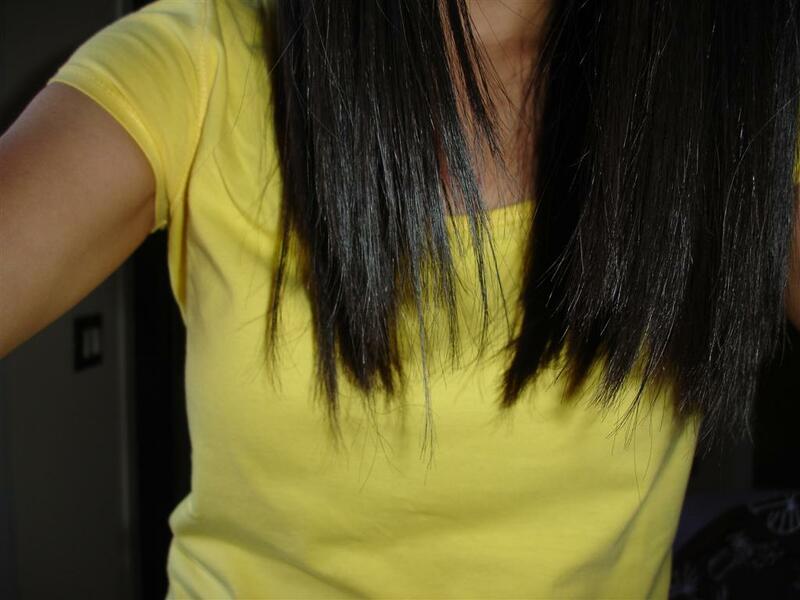 And now I look as if my 11 year old sister had cut my hair 😦 The supposed “layers” he gave me are all choppy and uneven. I didn’t want him to repair it as I was terrified that he would cut MORE of my hair off and leave me with short AND ugly hair. And now I have ugly choppy hair that looks even worse when I tie it up! 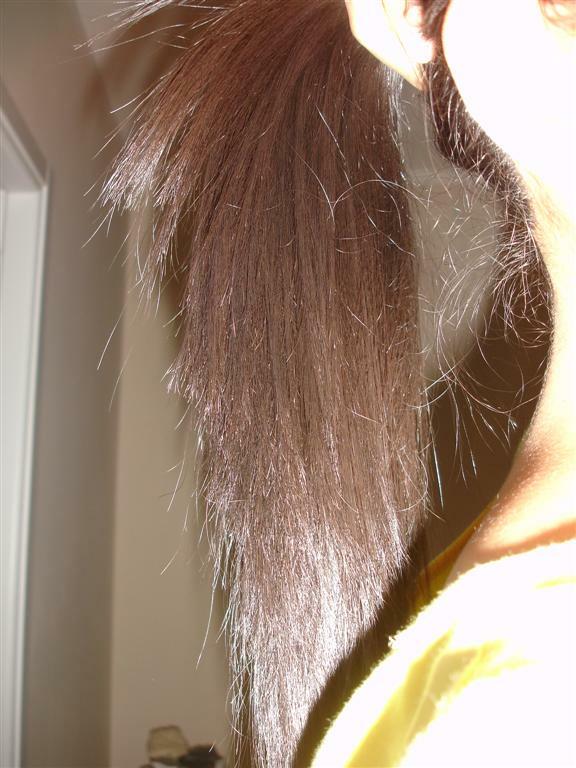 Do you see the uneven length??? Yesterday marked our two years of being married. Where the heck did all that time go??? I’m ageing faster than you can say Ineedbotox 😛 The hubs was in Latvia for work the past week, and arrived home at midnight. He was tired. I wasn’t feeling well. It was a simple “Happy-Anniversary” affair. This morning, I drove to the post office with him in tow, but he had already guessed that I was gonna drive to the post office to pick up his gift that had arrived from the US. I got him this as a gift, seeing how much he loves his wine. It is a highly acclaimed wine aerator that makes wine “breathe” without the use of a cumbersome decanter. My friend Tony helped me post it from the US. Thanks Tony! I got taxed a frigging 10.40EUR for it though. Friggin’ customs/Italian government/thieves/*$&%$*% I wonder what criteria they use on deciding to tax an item. My Kitchen Aid attachments came in a box that was 5 times the size of this, and I didn’t get taxed for it. Anywayyy, the hubs surprised me with a present too. Totally didn’t expect it. He’s gonna bring me for a 3 week trip to Malmo in Sweden next month! It coincides with some training programme that he has to attend, so we get to stay at the Hilton 😀 Not that’s its a huge deal, hotels in Europe are nowhere as fancy as the ones in Asia, I always wonder why. Then again, I’m grateful to be able to stay at the Hilton as opposed to some other ordinary hotel. Thank you babes! Two years have passed soooo very quickly babes. Here’s to many more years of happiness together! Ti amo. Ever since I arrived in Italy almost 2 years ago, I had been cooking in the hub’s ONE saucepan, ONE frying pan, and ONE 2 liter pot. It drove me nuts especially when cooking Asian food, as it was so difficult frying rice, noodles etc without a wok. Soups were a pain too as I had to fit everything into the tiny 2 liter pot, and many a time I grumbled to the hubs about this. Then, my unbeatable mum bought me a wok in Malaysia. Thing is, the wok was a Tefal Pyrex, and get this, it is made in Italy. 😀 So the made-in-Italy wok arrived in our Malaysian shores, was bought by a Malaysian woman for her daughter who so happens to live in Italy. I lugged that wok in my suitcase back to Italy by the way 😀 I think by now, most of you readers know how crazy I am when it comes to my food. It passed through the security checkpoint just fine and I stopped grumbling about the absence of a wok. Then I noticed that our the hub’s 2 liter pot was rusting at the sides. Oh joy! Finally a great excuse reason to buy a new pot. I did all the reading one could do about pots and cookware, and I discovered the wonder of the Le Creuset. Le Creuset is a French brand known for its high quality cast iron cookware items and dates backs to 1925. The beauty of cooking with cast iron cookware is that it has excellent heat retention and is great for long-cooking stews and braised dishes. The most famous Le Creuset product range would have to be their Dutch oven/cocotttes which is basically a casserole with a tight/close fitting lid. Le Creuset produces their cookware in a range of colours, and I totally fell in love with the red range as my kitchen has a white and red theme. 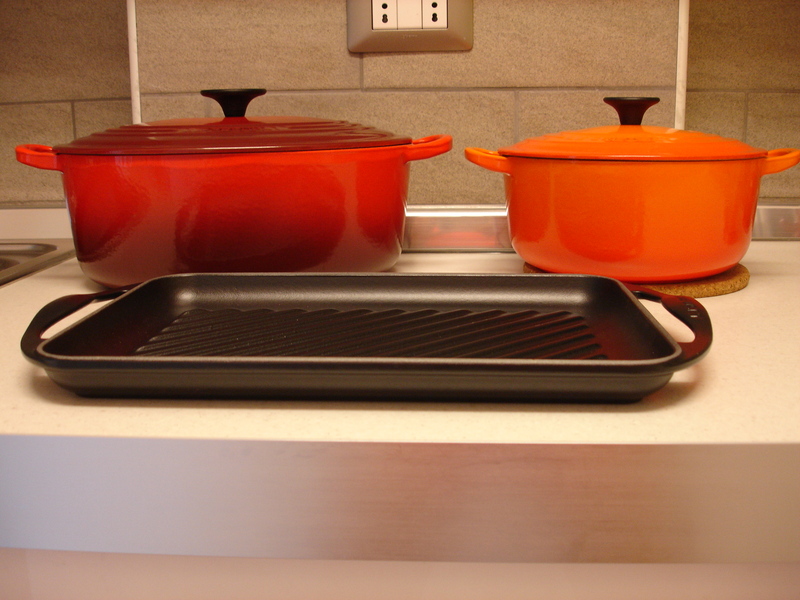 However, Le Creuset’s signature colour would be Flame (orange). There is a lifetime warranty on Le Creuset too, so if any defects were to appear on your pot that is not caused by misuse, Le Creuset would replace your pot, free of charge. I was lucky enough to discover that the only Le Creuset store in Italy was a mere 45 minute drive from my house 🙂 So I announced to the HB that we’re getting some new cookware as I was tired of cooking and entertaining with such miserable and tiny cookware. So off we went to the outlet store in Fidenza Outlet Mall. And boy oh boy was I lucky, as the red range was on 20% discount! 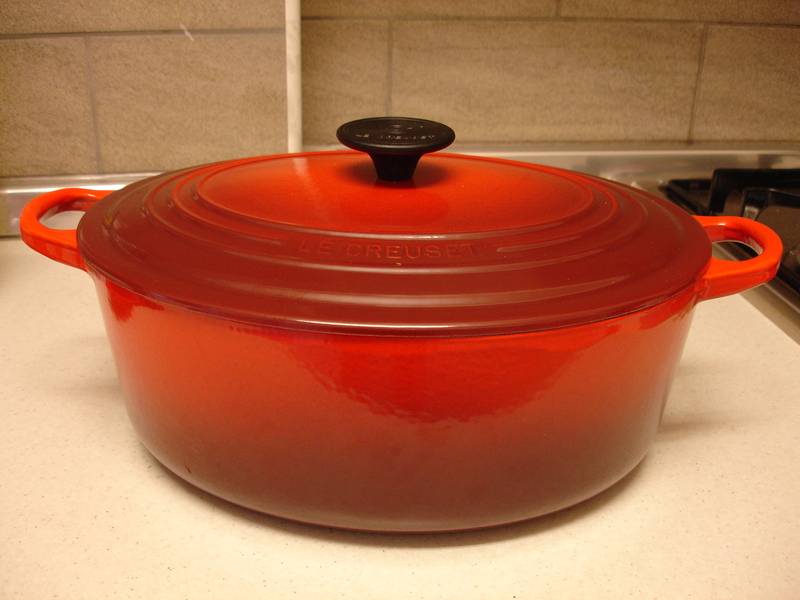 After much deliberation and suggestion by the very nice French lady there, I decided on the 29cm (4.7 liter/ 5 quart) Oval Casserole in Red. The lady then told me that sadly, the shop will be closing down for good in a couple of weeks time and there would probably be another sale during that period. So after a few weeks, I phoned the nice saleslady at Le Creuset and she told me that everything in the shop was at a 30% discount, and there would probably be a further markdown that very weekend to mark the first day of sales in Italy. I got as excited as heck and charmed persuaded the hubs to make another trip there. When we got there, the lady said that her boss had decided to keep prices as they were at a 30% discount, and so, there was no further reduction in price. Oh, but it was ok with me. I had gotten my eye on a nice saucepan the first time we were there, and this time around, it was all sold out 😦 So I didn’t get that. There was a Brazilian lady in there the same time we were, and boy, she was snapping up just about everything. I got a little nervous that she would snap up what I wanted (stock was low as everything was being cleared out), that I decided pretty quickly on what I wanted minus the dawdling about. I picked a 20 cm Round Casserole in Flame. I chose Flame coz after all, it is their signature colour. Kinda like how people buy a Louis Vuitton Speedy coz it’s a must have. 😛 I digress. So this is a slightly smaller/regular sized pot compared to my bigger oval one, perfect for 2-3 portions. Seeing the Brazilian lady snapping up the items off the shelf made me feel like I should get something else too 😛 and so I chose a Rectangular 32cm grill in black, as it was the only colour they had left. Looks like I will be grilling more often now 🙂 I’m gonna call up the store a few days before they close for good and *hope* that perhaps there’s gonna be a further discount going on. I was told by a friend that a Le Creuset pot in Malaysia is in the four digit range in Ringgit, so I am thankful that I can buy it for less than half the price here at the outlet store. I used to snicker at the thought of “changing” with age, but here I am, blogging about freaking pots and cookware. My Jimmy Choos have been relegated to the back of my closet, and I hardly bat an eye at the mention of Louis Vuitton anymore. But look at me salivating over pots. Just like how my mum was Tupperware crazy. Ageing does weird things to one, I tell ya. If I were a blogger….. I ask myself, how can I be a stay-at-home-wife and have SO MANY things to do?? I don’t have the answer in case you’re wondering. In any case, I’m glad as I have lots of things to keep me occupied. What has happened since I last wrote? Oh, it’s stale news by now, but I PASSED MY DRIVING EXAM! I have an Italian driving license now, and I can drive legally throughout the E.U. 😀 The test itself was rather anti-climatic. My examiner was a woman, which I thought spelt doom, as I’ve always felt that women are more observant and strict where everything is concerned. My driving teacher sat on the passenger seat beside me, and the examiner sat at the back. The teacher and the examiner were gossipping about some other person, and occasionally she would softly say “svolta adestra, svolta sinistra” (turn right, turn left). I had to strain my ears to hear her. Before the exam, my teacher told me that the examiners normally ask students to carry out more right turns than left turns, but oh-boy, my examiner made me do many left turns at the traffic light. If you are wondering, left turns at traffic lights are not the same as in Malaysia. So there, another adventure in Italy completed. I spent close to EUR1k for this; lessons, tests, taxes and what not. Tsk tsk. Oh, Whimsicaljottings also had its 1.5 seconds of “fame” in The Star, a Malaysian daily. Click here to read it.